Safety slogans can provide catchy ways to simplify complex safety concepts and make them easy to remember. They can be used in various ways to reinforce top-of-mind safety awareness throughout the workplace, including on signs, banners, posters, shirts and more. You can also include safety slogans in employee newsletters, training materials and other forms of internal communication. If you're looking for slogans to convey safety messages in your workplace, one or more of these unique slogans might meet your needs. It costs less to be safe every day than to make one careless mistake along the way. Safety first, last and forever. 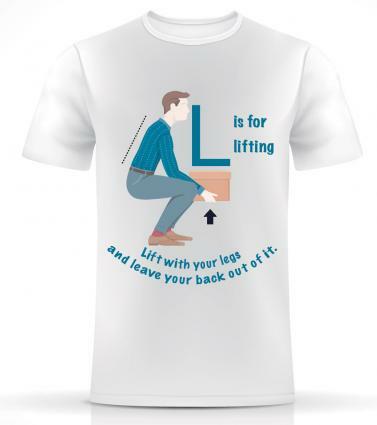 "L" is for lifting - Lift with your legs and leave your back out of it. Life is too short to take unnecessary chances. When should you report a safety concern? Right away - as soon as you learn! At your desk, do not slouch - or later you'll be saying ouch! Sit up straight as you type away will help keep you safe throughout the workday. Keep cords out of the way so that on your feet you can stay! Your chair is your throne - adjust it to fit your work needs alone. The way you sit is no minor thing - pain is what an uncomfortable workspace will bring! Wearing PPE is the right thing to do for you and me. The time you spend putting on safety gear makes a safe end to your shift all the more near. A trip to the hospital takes a lot longer than putting on your safety gear. Don't wait for equipment to break - preventive actions are important to take! Safety risks aren't yours to take. You're not the only one who will suffer from your mistake. When working outdoors in the heat, protect your skin from your head to your feet. Don't wait until you're thirsty to drink - you're body needs water before about it you'll think. When the sun is high take cover in the shade; this is a safety guideline that needs to be obeyed. Take cover indoors when you hear thunder pound, even if there's no visible lightning around. When lightning is something you can see, indoors is where you need to be. In addition to the original slogans provided here, there are plenty of online resources where you can find additional ideas. LoveToKnow Safety Slogans - A great list of general safety slogans that apply to a variety of situations. SafetySlogans.info - This safety resource has a long list of safety slogans to consider, as well as examples of funny safety signs and images that have slogans on them. While not all of the slogans given are work-related, many of them are great choices to use for business purposes. BrandonGaille.com - This small business blog has a post that features more than 150 short, catchy slogans all focused on various aspects of safety. As this blog is targeted at business owners, all of the slogans given can be useful for a business environment. Any tools you can use to encourage your employees to follow appropriate safety procedures can help improve safety within your company. Slogans aren't the only option. Also consider using safety-related quotes, pictures, posters and even jokes to help spread a message of safety throughout your organization.